I remember my freshman year of high school like it was yesterday; particularly one sunny September morning as my mother drove us to school. I was mad because I didn’t like how my hair looked that day. Truly, a tragedy, by any freshman girl’s standards! I couldn’t possibly walk into the halls of my small school looking like I did. Too bad; we had arrived. In I walked, sulking and mumbling to myself about what a crummy day it was going to be. Little did I know. I went to a small Christian school, and that particular week everyone met each morning in the assembly room for a devotion. The principal started out with a request– we were to pray for the victims of what appeared to be a small plane crash into one of the skyscrapers of the World Trade Center complex in New York City. “World Trade Center?” I hadn’t a clue what it was. Still, my heart was saddened by this accident. We continued on with our devotion, and just a few moments later the door to the large room opened, and the school’s secretary came in. I’ll never forget the look on her face. She was ashen–her eyes wide open in shock. Disbelief spewed from every pore of her being. It was very clear that something was horribly wrong. She broke the latest: it wasn’t a small plane; it was a commercial jet. And another one had just hit the second Tower. We all set there, stunned. We knew for certain now that this was no accident. The room was abuzz with questions. The day progressed, and we learned, horrified, of the Pentagon and the Pennsylvania crashes. The school was put on lock-down, and we set stupefied in our seats. Some talked frantically; others were entirely silent. I’ll never forget watching one of my teachers bow her head on the table in utter shock as the rest of us sat there trying to comprehend it all in our young minds. All flights had been grounded by this point, and the near constant airline traffic over the skies east of Chicago was absent. Everything was eerily silent. Suddenly, the sound of airplanes came roaring in the open window, and her head jerked up. We ran to the window and saw two fighter jets as they sped off into the distance. Fighter jets. Over my school. And they’re not practicing. But I live in America! What? As I sat trying to wrap my head around it all, I realized that for the first time that the threats to freedom that I had grown up learning about had suddenly become a very, very real part of my young life. I was abruptly faced with the realization that our freedom can be attacked, and that there existed the reality that there were people ready and willing to carry that out. America wasn’t invincible . . . and that shocked me to my core. I wasn’t a victim on that day. I lost no family members . . . though a brother would later fight to defend our nation in our retaliation. 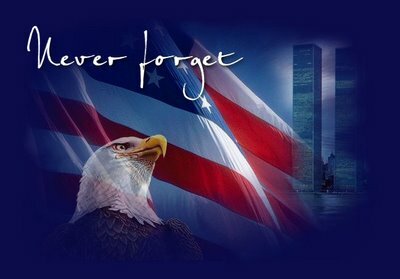 Still, each year on this day my soul grieves for my nation, and for the thousands of innocent lives that were brutally stolen from this earth by the world’s true cowards. Here’s a challenge for our nation’s decision makers on this most sacred a day in our country’s history–let’s not tarnish the memory of the fallen by coming to the aid of their killers . . . by aiding Al Qaeda in Syria. Thank you for your personal accounting of that day. The inserted photo was inspiring. You were a freshman in High School that day, but today there are freshmen in High School who have no memory of it. Today, they will read history textbooks in their classes that make no mention that this was an Muslim Islamic attack on Hebrew/Christian Western Civilization. The terrorist will be called freedom fighters, and Bin Laden’s photo will be on one of the pages of one of those books. To erase or rewrite history is a goal of Islamic Jihad. Thanks for adding to the fight against that agenda by your post. Thank you both for the kind words– I can’t believe how many young people today don’t remember or even acknowledge the importance of 9/11. My sister said she saw exactly ONE person on her college campus wearing something patriotic that day. How sad, no? Thank you, Bruce, for continuing to educate as many as you can as to the rewriting of our history at the hands of radical Islamists. Yours is such an important task– one that truly will impact the lives of our young people!